A sweet crochet crisscross matinee coat uk format pattern, a quick design, you will needing some crochet knowledge, requiring three small buttons to fasten, I’m sure you will love making it. 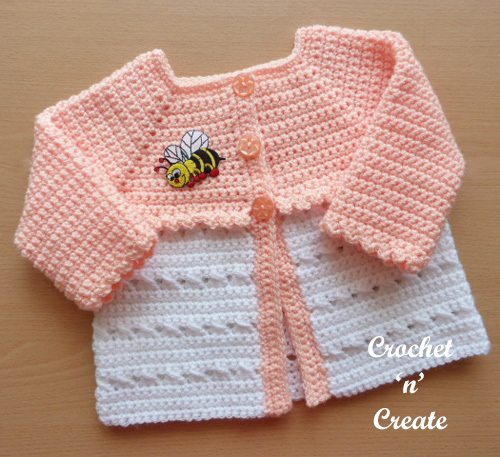 See my FREE Baby Popcorn Coat and Puff Stitch Cardigan patterns. Worked in one piece starting with yoke. 2nd Row – 1ch, 1dc into base of 1ch, 1dc into each dc to end. Turn. 4th Row – Rpt 2nd Row. 6th Row – Rpt 2nd Row. 8th Row – Rpt 2nd Row. 10th Row – Rpt 2nd Row. 12th Row – Rpt 2nd Row. 14th Row – Rpt 2nd Row. 16th Row – Rpt 2nd Row. 19th Row – Working into back loop of stitch for this row only, join in colour 2, make 1ch, 1dc into base of 1ch, 1dc into each dc to end. Turn. 20th Row – Working through the both loops of stitch from now on, make 1ch, 1dc into base of 1ch, 1dc into each dc to end. Turn. Rpt 21st to 26th Rows until 44 rows have been worked in all or work measures approx 11 Inches from shoulder. Fasten off. Turn. Starting with 1ch, 1dc into base of 1ch, work 26 more rows of 1dc into each dc, slip stitching to first dc and turning at the end of each row. Next Row – 1ch, (1dc, 3ch, 1dc) into next dc, * miss 1dc, (1dc, 3ch, 1dc) into next dc, * rpt from * to * to last dc, miss 1dc, ss to first dc on beginning of row. Fasten off. With neck towards you, working downwards on coat, return to loose loops on the bottom of the yoke (the one’s you created on the 19th Row), join in colour 1 and work 1ch, 1dc into base of 1ch, (1dc, 3ch, 1dc) into next dc, * miss 1dc, (1dc, 3ch, 1dc) into next dc, * rpt from * to * to last dc, work 1dc into last dc. Fasten off. Button/Buttonhole Bands – With RS facing and 4.00mm hook, join colour 1 to base of right hand side of front edge, make 1ch, 1dc into base of 1ch, work 42 more dc evenly into row ends to neck edge, 3dc into corner, 1dc into each ch around neck, 3dc into corner, 43dc evenly into row ends down second front edge. Turn. Starting with 1ch, 1dc into base of 1ch, work 1dc into each dc to neck edge. Turn. Work one more row in dc on these stitches. Fasten off. Finishing – With WS facing close small gaps underarm, weave in all loose ends of yarn and trim, turn through to RS sew on buttons to correspond with buttonholes. Hope you enjoy this cute crochet crisscross matinee coat uk format pattern, don’t forget to pin it for later. The written instructions and pictures for this free crochet crisscross matinee coat uk pattern are copyrighted to crochet ‘n’ create © 2018. 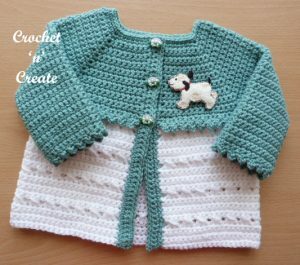 You are welcome to sell the finished products made from the free crochet crisscross matinee coat uk pattern, I just ask that you please use your own pictures and put a link back to crochet ‘n’ create. DO NOT share the written instructions for this crochet crisscross matinee coat uk pattern. This entry was posted in Baby crochet pattern and tagged baby crochet cardigan, baby crochet patterns, crochet, free crochet patterns on 8th March 2018 by crochetncreate.